The CCA announced today that the 2009 Canadian Wheelchair championship will be held March 23-28 at the Lakeshore Curling Club in Lower Sackville, Nova Scotia. Last month BC successfully defended its title in Winnipeg, Manitoba, defeating Ontario 8-6. The 2nd Annual Norwegian Open will be held at the Halden Curling Centre from the 27-29 October, 2008. The venue is 120 km south of Oslo, close to the Swedish border. Canada will return to defend the title they won in an 8 team field last year, where they fielded the same team that went on to represent Canada at the 2008 Worlds. Team USA, coming off their podium finish at the Worlds, is also planning to compete in this year's 10 team field. 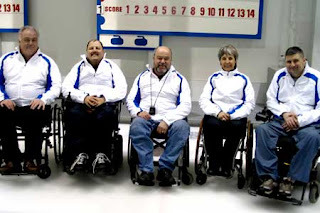 The Sherbrooke Record reports that curler and wheelchair sports coach Alfred Whittier has begun recruiting wheelchair users to curl out of the Lennoxville CC in Quebec. His core group, including Paralympians at water skiing and archery, who at present are the only active wheelchair curlers in Quebec. For more information call Al Whittier at 819-566-7315, or Benoit Lessard at 819-837-2269 and visit www.lennoxvillecurling.ca. Changes to the rules governing World Curling Federation sanctioned wheelchair curling events will be discussed during meetings at the Men's Worlds in Grand Forks ND this week. The rule that a stone must be touching the centre line at delivery, is likely to be eased to bring the wheelchair game more in line with the angles available to players who use the hack. The counter-argument, as made to me by Norway coach Thoralf Hognestad during the 2008 Worlds, is that wheelchair users unhappy with the present rule should simply move back to the hack to compensate. The WCF intends its rules to encourage participation by people with as wide a range as possible of disabilities requiring wheelchairs for daily mobility. While remaining sceptical about the utility of a disability points classification system, there's a desire to avoid wheelchair curling becoming the sole province of the heavily muscled. This is why they will prefer to move the rock off the centre line, rather than back from the hogline. It is also why skips are unlikely to be allowed to use brushing in the rings. There are good arguments for Canada to be flexible in implementing WCF rules in its domestic program, especially as Team Canada exists independent of national competition. The mixed gender team rule, for example, while ensuring participation of women in countries with minimal overall participation, is probably unnecessarily restrictive in Canada where the potential for hundreds of teams certainly exists. It would be a shame to see Canadian development inhibited by an insistence that 25% of participants be female, when eligible males far outnumber eligible females. Any WCF rule changes will not be implemented until after the 2010 Paralympics. The sixth season of wheelchair curling in Canada closes with the TSX sponsored 2008 National Championships in Winnipeg at the end of March. Nova Scotia and Northern Ontario will make their first appearance. Laughie Rutt, Nova Scotia third and irresistible force behind the provincial program, is realistic about his chances: "We've been working hard and hope to be competitive. We have experienced coaches, and this year's competition will at least prepare us for 2009 when we will be hosts." He’ll face experienced opposition. It is Alberta's Bruno Yizek’s third championship. He won a five team Alberta playdown. Ontario's Chris Rees makes his fourth appearance after beating Chris Daw in a four team Ontario playdown. Manitoba's Chris Sobkowicz earns his fourth Bison jacket, this time at third. Darryl Neighbour, as a Team Canada member, was ineligible to participate in BC’s selection camp, so Jim Armstrong will skip an otherwise unchanged side. Vince Miele gets the nod as alternate for years of good natured toil in the trenches. CurlBC appear finally ready to abandon their selection camp circus and hold a playdown next year. While acknowledging the disappointment of not medaling at the Worlds, national program director Gerry Peckham summed up Team Canada’s year: “We invested far more in the selection of Team Canada 2008 from the National Talent Pool than we did in preparing Team Canada 2008 to win the Worlds, We will now turn our focus to preparing Team Canada 2009 to win the Worlds, and in turn the 2010 Paralympics." Team Canada is as experienced as any in the world. Sonja Gaudet, Gary Cormack and Gerry Austgarden won gold in Torino. Ina Forrest was on the 2007 Worlds team, and both she and newcomer Darryl Neighbour led at their positions at the 2008 World Championships..
Peckham promises more meaningful competition next year, perhaps against able-bodied practice teams . While his squad practice on their own, and play in leagues, throwing rocks without chairs being braced, and playing in games where poor shots suffer no consequence, may not be helpful. With only a part-time national coach, the CCA might want to consider enlisting local coaches to monitor practices and league performances. Wheelchair curling practice needs at least two people on the ice. I’m sure there are plenty of coaches and club players who would assist if asked. Although shot making percentages are slowly rising, wheelchair curling remains a game of misses. Looking at the shot by shot diagrams from the 2008 Worlds, it seems that games are not won by great shots so much as lost by draws that do not make the rings, and attempted hits that flash. Great shots, take-out doubles, hit and sticks, and draws to the button do win games; just not very often. Twice world champion Norway’s coach claims to plan for missed shots, and successful teams will not only call high percentage shots, but those that allow for frequent misses. I’d be tempted to question the value of any stone not put immediately into the rings. Six end matches are a lot more of a lottery than we might like to admit to the sponsors. I’ll take the team that can put 7 stones somewhere in the rings every end. What you can do over the summer to prepare for next season? Here’s a tip I first heard from BC coach Kevin Rouck. Good players have a routine that they follow before they throw. If it is interrupted they start over. By internalizing this routine, they don’t have to think about how to throw. They can just concentrate on line and weight. Make a list of the things you do to deliver a stone. Start at your approach to the rock. Include where your body sits in the chair, how you anchor yourself, how you position the rock and place your stick on the rock handle, how you breathe as you prepare to throw. Then visualize your delivery motion, note where your elbow is during delivery, where your hand ends up. That sequence, and it will be different for every wheelchair curler because our bodies are all different, is your delivery script. Write it down, revise it to include every action, and then read it and practice it for a few minutes every day away from the ice. You’ll find next season it will be as though you were never away. Corinne Jensen, the infatigueable force organizing wheelchair curling on the Island, is arranging a Pros against Wheelchairs challenge at the $81,000 Bear Mountain Curling Classic. It will take place at Juan De Fuca near Victoria, BC, on Saturday April 5th at 2.30pm. The Pros will have to play from wheelchairs, which should even things up just a little. On Sunday April 6th, between the semi-final and final games, there will be a demonstration of wheelchair curling. left to right: Jim Armstrong (skip), Frank LaBounty (3rd), Vince Miele (alternate), Jackie Roy (lead) and Whitney Warren (2nd). BC won their 2nd successive championship as they overcame an early deficit to beat Ontario 8-6 in the final of the 2008 TSX Canadian National Championship. BC began with the hammer and gave up an immediate steal of 2 on a measurement when their last rock hit rolled too far. In the second they gave up another steal when their last rock draw was short, again on a measurement. In the third, with Ontario ahead 3-0, a great draw by BC 2nd Whitney Warren led to a succession of guards, and a couple of accurate hits by BC skip Jim Armstrong that scored 4 for a 4-3 lead at the break. Ontario skip Chris Rees faced big trouble with his final stone in the 4th and was heavy with his draw, giving up a steal of 3. He was gifted 3 straight back when a succession of missed hits from BC, attempting to keep the rings clear, allowed Ontario to pull within one, 7-6 after 5. In the final end, Rees made a great last shot, picking out BC's shot rock that was half buried, and rolling to the back 8’, covered and shot rock. BC had to draw full 8’ for the win and though Jim Armstrong's draw looked as though it might be heavy, it stopped back 4 for the win and their second national championship.